Looking back on some great KO's in boxing; Lights Out! Looking back on some great KO’s in boxing; Lights Out! This great sport has produced many thrilling, moving, shocking and even unforgettable knockouts throughout its history. And though many boxing fans tune in hoping to see other things: skill, defence, speed, overall ring generalship – there really is nothing like a sizzling KO! George Foreman KO2 Gerry Cooney, 1990. “Big” George’s first real test since coming back, and how he delivered! A great heavyweight, heavyweight KO. Floyd Mayweather KO4 Victor Ortiz, 2011. Illegal headbutts followed by the ultimate cheap shot. Protect yourself at all times! Denis Lebedev KO10 Roy Jones Jnr, 2011. This one was just nasty. Jones, already way past his best, took severe punishment from a power puncher before he finally fell. Again, nasty. Lennox Lewis KO4 Hasim Rahman, 2001. Fans even heard the sound of these punches! A revenge KO for Lewis, the result of even more destructive punching power than the kind Rahman delivered on the heavyweight champ in fight-one. James Toney KO12 Prince Charles Williams, 1994. His left eye hammered shut, Toney drilled Williams with a sizzling right hand that sent him reeling in the final round. Never did Toney make his nickname seem so appropriate. Sam Peter KO2 Jeremy Williams, 2004. How much of a beast was Peter back then! A sickening KO, one that left Williams out cold and in need of a stretcher. Mike Tyson KO1 Marvis Frazier, 1986. A rampaging pre-title Tyson nearly decapitated Frazier! Antonio Tarver KO2 Roy Jones Jnr, 2004. Quite simply a KO that shocked the sport. David Tua KO1 John Ruiz, 1996. A brutal annihilation of a normally durable fighter. Tua’s future looks so bright. Sergio Gabriel Martinez KO2 Paul Williams, 2010. A one-punch classic. Even more shocking considering “Punisher” Williams had won the first fight, by close decision. Roy Jones Jnr KO4 Virgil Hill, 1998. A truly rib-crunching, one-punch KO over a very fine fighter. Thomas Hearns KO4 Juan Domingo Roldan, 1987. “The Hitman” makes history as the first-ever four-weight king, by way of this face-plant KO over the teak-tough Argentine. Danny Williams KO6 Mark Potter, 2000. Not a marquee fight, and officially a TKO, but this unlikely turnaround stoppage win scored by Williams has to have a place. Suffering a dislocated shoulder and all-but defenceless, Williams amazingly turned it around, scoring the stoppage with his good arm! Bernard Hopkins KO9 Oscar De La Hoya, 2004. Another great body shot KO, one scored over a near-prime De La Hoya. Kevin Kelly KO 8 Derrick Gainer, 1996. His eye hammered shut, having suffered a knockdown and losing the fight, Kelly, showing incredible heart and guts, turned Gainer’s lights out via highlight reel KO. Stunning. Donovan Razor Ruddock KO4 Michael Dokes, 1990. Truly chilling, and the arrival of a new heavyweight star. Lennox Lewis KO2 Donovan Razor Ruddock, 1992. This time Razor was on the receiving end! Lewis’ star was born. Julio Cesar Chavez KO12 Meldrick Taylor, 1990. Okay, this one was a TKO – one of the most controversial in history in fact. But talk about an unforgettable stoppage! Roy Jones Jnr KO1 Montell Griffin, 1997. Griffin was knocked silly by a ruthless Jones who had controversially lost a previous encounter with Griffin. There are certain KO’s that leave you with an uneasy, squirming sensation. This one-punch KO is such a knockout. James Douglas KO10 Mike Tyson, 1990. The Upset of The Century! Also an extremely tide piece of punch accuracy and venom by Douglas. 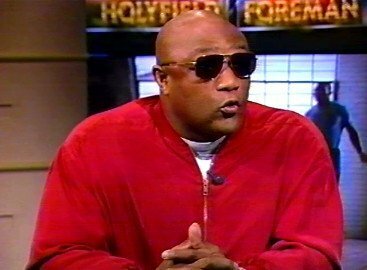 George Foreman KO10 Michael Moorer, 1994. Old George makes history courtesy of his ageless right hand! Vincent Pettway KO6 Simon Brown, 1995. Truly frightening was the sight of an unconscious Brown, still throwing punches as he was flat on his back. Ray Mercer KO5 Tommy Morrison, 1991. Another grizzly finish, this one seeing a defenceless Morrison being blasted by shot after shot after shot as he was out of it on the ropes. Gruesome. Iran Barkley KO3 Thomas Hearns, 1988. After taking a real shellacking, Barkley sensationally turned the fight completely around with a shot from hell. Arguably the upset of the decade. Nigel Benn KO10 Gerald McClellan, 1995. A tragic ending to one of the most brutal fights in modern day boxing history. Mike Tyson KO1 Michael Spinks, 1988. Tyson at his peak, against an unbeaten foe. And to think, at the time Spinks was seen as Tyson’s toughest test. Julian Jackson KO4 Herol Graham, 1990. Uneasy feeling time again. Jackson, a defensive master who was boxing rings around Jackson, got tagged and he was out before he hit the floor! Manny Pacquiao KO2 Ricky Hatton, 2009. Hatton was knocked cold by an absolute sledgehammer. This one is comparable to the immortal Sugar Ray Robinson’s textbook one-punch KO of Gene Fulmer. This version of Pac-Man was terrifying. Mike Tyson KO2 Trevor Berbick, 1986. “And we have a new era in boxing.” Tyson also scored a chilling, humiliating and wholly unforgettable KO. Even all these years later, has it even been topped? Picture the violence now, then watch it on You Tube – it’s worse than you think. Tyson, at his peak, at his fastest, landing punches with so much lightening no other heavyweight stood a chance. The image of Berbick trying, pitifully, to stand after taking Tyson’s dynamite is truly unshakable. You are here: Home / Boxing History / Looking back on some great KO’s in boxing; Lights Out!